An esports event using the new Racecraft racing game is set to take place at the Rimini Amusement Show from March 13-15, in the Italian city. 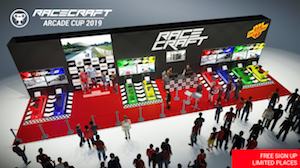 Tecnoplay, the official distributor of the game for the amusement market, has collaborated with the Italian Exhibition Group to present the first edition of the Racecraft Arcade Cup which will be held in the events section of stand C4. Qualification for the event will take place every day of the show from 10am, and at 5pm the best drivers will contest the final on the four Racecraft seats specifically configured in tournament mode, and winners will receive rewards at the end of each day. Participation for the competition is free and available places are given in order of arrival and registration at the Racecraft Arcade Cup stand. A certiannumber of places have already been reserved to the fastest drivers selected by amusement arcades operators that purchased the two or four seats versions of Racecraft. Marketed as the first driving simulator created specifically for the Amusement market, Racecraft is reported to be enjoying success in the locations it is already operated in and with this new event, Tecnoplay aims to show attendees in Rimini how to engage and retain visitors of amusement arcades and FECs by offering organised esports competitions.